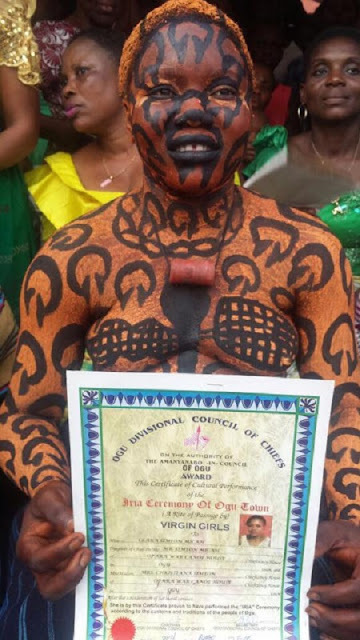 A vir-gin ceremony called the Iria ceremony held yesterday Saturday, in Ogu town, Rivers state. The girls who are vir-gins appeared in public covered from the waist up in just paint at the event. The Iria Ceremony is practiced in some parts of Nigeria, it is mostly predominant in the Delta tribe. The ceremony is a celebration of feminity, preparing the tribes girls for marriage. As every girl is born, they develop romantic attachments with the water spirits of the tribe. Undergoing this ceremony will help the girls "detach" themselves from the spirits so they may marry. Girls the ages of 14-17 will begin the process of becoming "wife material". 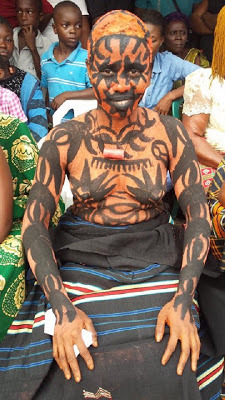 Before they can start, they have to stand in front of their entire tribe to have their n*ked bodies painted and inspected to insure their virginity. After inspection, the girls will be held in rooms called "fattening rooms". They can be held in the rooms for 1 to 6 months. The purpose is to plump up the girls because it is believed a "bigger" bride will be more beautiful and have a better chance to carry children. While in the rooms, they will learn songs to sing on the final day of the ritual, these songs are believed to release the girls from the water spirits. Once the girls are finished in the fattening rooms, they will all travel together down to the tribes river. When they get there, they will sing the songs they learned while the Osokolo (senior male of the tribe) beats the women with a stick to ward off the spirits. This part of the ceremony differs because other tribes will ward off the spirits before fattening or the tribes men will beat the women instead of the Osokolo. The women are generally bare chested while this is being commenced. Once the ceremony is over, the town square will be decorated for the girls to celebrate their transition into women. When the new women are released, songs and drums are played to make merry.